Alaska Day is observed on October 18. It has the status of a legal holiday in the U.S. State of Alaska. On this day in 1867, the territory of Alaska was formally transferred from Russia to the United States. On March 30, 1867 Russia sold Alaska to the United States for the sum of $7,2 million. However, the formal transfer was arranged in October 1867 when the commissioners arrived in the city of Sitka (formerly New Archangel). The formal ceremony took place at Fort Sitka on October 18. American and Russian troops paraded in front of the governor's house where the Russian soldiers lowered the Russian flag and the United States flag was raised instead. Most Russian citizens left Alaska except for a few priests and traders. 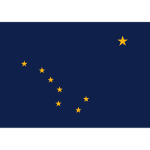 Alaska Day was declared a legal holiday in the state of Alaska in 1917. It is a paid holiday for state employees. In Sitka, many businesses close for the day and students are released from schools early so they can take part in the official celebration. The celebration typically includes a parade and reenactment of the flag-raising ceremony. Alaska Day should not be confused with Seward's Day, the anniversary of the signing of the Alaska Treaty of Cessation. Seward's Day is celebrated on the last Monday in March.